Stopped way down and focused about 4-5 feet away to get everything in focus as well as possible. Used a little negative exposure compensation to keep the bright area over the mountain from blowing out. A grad ND filter wouldn’t help much because besides darkening that small bright area it would have darkened everything else (already too dark) as well. I was here at Mormon Row for the mandatory, been there & saw this, image of a Mormon Row barn. I was treated to the site of this storm approaching from my left across the mountains and up the valley – forget the barn; already did that yesterday. The speed of the storm didn’t give me much time to find a spot and set up. Those mountains disappeared from sight within less than two minutes of this shot (along with most of the mid-ground). I’m an absolute fanatic about foregrounds in landscapes. If I can’t find one I’m not interested in the shot (whatever & wherever it may be) except as a record shot. Lay down flat, move, walk, whatever – but I have to find something. Imagine this scene without the fence – if I’d moved about 30-40 feet to my right. Boring…. Even with the composition elements that support the illusion of depth, the image is still too flat (see below). Lighting adjustments can help draw the eye further into the image. 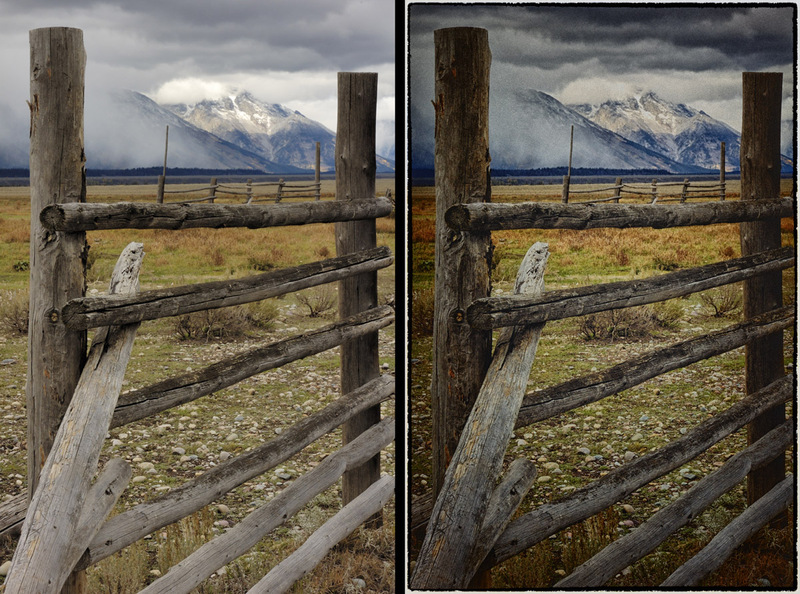 Here’s the comparison of step #1 (from the camera) and step #4 (today’s featured image). Click to enlarge. Note how the light-center/dark-perimeter adds to the illusion of depth by drawing your eye into the scene. Also, to your eye, warm colors (the corral foliage) advance and cool colors (clouds and mountains) recede thus further enhancing the illusion (in contrast, let’s say, to a blue lake in the mid-ground and warm fall colored foliage in the background which sends conflicting messages to your brain). Painters can do the “eye-tricks” with their brush but we photographers have to play the hand that’s dealt to us (providing we know the rules of the game). Here’s the output of SEP2 that was blended with the in-camera result. If you want the feeling of depth in your landscapes it takes the right subject, the right composition and often some post processing, as well, to bring it all together. 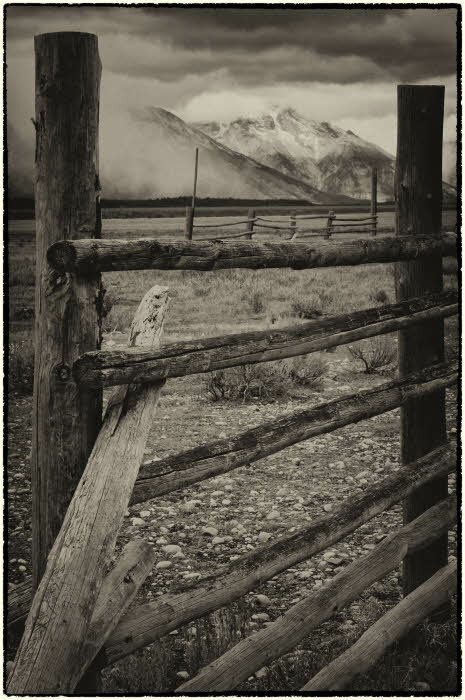 This entry was posted in Composition, Craftsmanship, How did you make that image?, Post-Processing and tagged Art Photography, Black and White, Black and White Conversion, Black and White Photography, Color Efex Pro, Image Editing, Infrared, Infrared Photography, Nik Software, NX2, Outdoor Photography, Photography, Photography Composition, Photography How To, Photography Technique, Photography Tips, Photography Tutorial, Photoshop, Post processing, SEP 2, Silver Efex Pro, Silver Efex Pro 2 by Ed Knepley. Bookmark the permalink.